In 1985, Cindy Van Dover, then a graduate student in biology in the MIT/WHOI Joint Program, discovered a novel light-sensing organ on a unique species of shrimp that lives at high-temperature, black smoker chimneys on the Mid-Atlantic Ridge. If this photoreceptor were indeed some sort of primitive “eye,” the question instantly arose: At depths of some 3,600 meters, where sunlight cannot penetrate, what are these shrimp looking at? The search for a source of light in deep-sea hydrothermal environments began. The shrimp that Van Dover investigated, Rimicaris exoculata, lack normal eyes and eyestalks; hence the name exoculata, which means “without eyes” in Latin. This fact did not seem surprising considering the pitch-black depths where these shrimp dwell. But ensuing anatomical investigations revealed the existence of a large, reflective organ on the shrimp’s dorsal side beneath the thoracic shell. Subsequent studies of its structure and pigment supported Van Dover’s hypothesis that it was some type of eye. The organ does not create images, but it is a very sensitive photoreceptor. It is uniquely adapted to maximize the absorption of light at about 500 nanometers, in the blue-green part of the spectrum. But what kind of light were these shrimp “looking” at and where was it coming from? The most plausible light source is thermal radiation from the extremely high-temperature (above 350°C) fluids discharging from the vents. Thermal radiation is the light emitted from a hot, dense object—the same phenomenon that causes the heating element, or burner, on an electric stove to glow. In 1988, on a cruise to the Juan de Fuca Ridge in the northeastern Pacific, Van Dover persuaded John Delaney of the University of Washington to take a picture of a black smoker vent with a charge-coupled device (CCD) camera while all of the submersible Alvin’s external lights were turned off and the portholes blocked. Indeed, the image revealed a glow emanating from the vent orifice (photo below right). Since that time, a group of marine geophysicists, chemists, biologists, and physicists has been studying the phenomenon to learn what causes the light, what the light can tell us about vent properties, and how biological communities at the vents respond to the light. The first confirming image of “vent glow” offered no data to characterize the light. In an effort to obtain a rough spectrum of the light, OPUS (Optical Properties Underwater Sensor) was built at Woods Hole Oceanographic Institution. OPUS is a simple photometer that measures light intensity at various wavelengths. OPUS consisted of four to eight photodiodes covered with individual optical bandpass filters, which together cover the spectrum from 400 nanometers (in the blue part of the visible) to 1,000 nanometers (well into the near infrared). The visible region of the electromagnetic spectrum (that is, what humans are capable of seeing) ranges from 400 nanometers (violet) to 750 nanometers (red), with the infrared region extending on to about a million nanometers. The search for light is limited to the 400- to 1,000-nanometer region because below and above that range, light intensity greatly decreases as it passes through water. This phenomenon is called attenuation; light is attenuated the least at approximately 500 nanometers, allowing blue-green light to travel the farthest and giving the ocean its characteristic color. OPUS was deployed using Alvin at black smoker chimneys on the Mid-Atlantic Ridge and the East Pacific Rise during four cruises between 1993 and 1997. The OPUS data revealed that most of the vent glow is in the infrared region of the spectrum (greater than 750 nanometers), which suggests that the light is primarily due to thermal radiation. The OPUS data were consistent with the spectrum of a theoretical “black body”—an ideal body that absorbs and emits all the radiation falling on it. Light emitted from a black body is dependent only on the temperature of the body. For a 350°C black body, a graph of light emission would peak at long wavelengths (about 4,600 nanometers), with a tail extending down into the 400- to 1,000-nanometer region (see light emission plot below right). OPUS recorded light emitted in this tail region. OPUS successfully provided a rough spectrum of the light emitted at vents. That is important in determining possible light sources, since certain mechanisms can cause light emission at certain wavelengths. However, OPUS lacked an imaging capability, and knowing where the light is emitted at a black smoker (at the orifice or higher in the plume, for example) may also hold important clues to which sources are more likely. To obtain both images and spectral information, a special charge-coupled device (CCD) camera was commissioned by WHOI. It is called ALISS (Ambient Light Imaging and Spectral System). The development of CCD technology in the 1970s was of great interest to astronomers who measure very faint sources of light—stars billions of light-years away. A CCD is basically a silicon chip that is divided into a number of pixels (picture elements), each of which acts like a bucket holding incoming photons. The advantage of a CCD is that it can digitally image very faint objects by using long exposures to increase the number of photons captured in each pixel. Long exposure times are necessary for ALISS to capture vent glow, which is too faint to be seen by the human eye. The ALISS camera, built by Princeton Instruments Inc. of Trenton, New Jersey, contains a CCD chip with a 1,024-by-1,024-pixel grid. It has a set of optics, designed by Truax Associates of Southington, Connecticut, consisting of nine individual lenses that divide the CCD plane into nine smaller tiles, each roughly 340 by 340 pixels. The nine lenses in front of the chip are each covered by individual optical bandpass filters with wavelength bandwidths of roughly 50 nanometers and 100 nanometers. Thus, ALISS can obtain nine separate and simultaneous pictures—each in a different wavelength band. Equipped with two separate nine-filter arrays, ALISS can obtain images in 18 wavelength bands per dive. ALISS is controlled by a scientist inside Alvin using a personal computer, which also stores the ALISS data. Two lasers mounted on top of ALISS cross at a distance of 50 centimeters in front of the camera to aid the Alvin pilot in positioning the camera within its focusing range of 50±25 centimeters. Because the light emanating from vents is so faint, ALISS must take a number of long exposure images (5 minutes each), which can then be added together and/or averaged electronically. This requires the submarine to remain stationary and in the dark (all external lights and lasers turned off and all viewports blacked out) for 5 minutes at a time—not a completely comfortable prospect when you are a mere half a meter from water hot enough to melt Alvin’s viewports. A number of corrections are made to the ALISS images during processing to account for variations in the response from one pixel to the next, as well as for surplus charge buildup in the pixels that is unrelated to the incoming light. The camera was calibrated between cruises at the California Institute of Technology with the assistance of Palomar Observatory scientists, who have extensive experience with CCD devices used, in their case, to explore outer space. 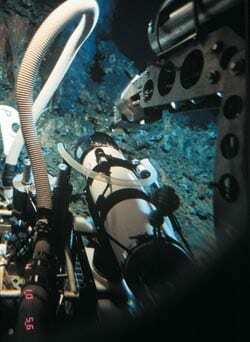 ALISS has been deployed at deep-sea hydrothermal vents in the 9°N area of the East Pacific Rise (November–December 1997) and in the main Endeavour vent field of the Juan de Fuca Ridge off the Pacific Northwest coast (June–July 1998). Images have been collected from black smokers and flange pools whose venting fluids range in temperature from 250° to 375°C. Black smokers and flange pools are very distinct types of hydrothermal venting. At some large chimney structures (particularly on the Juan de Fuca Ridge), flanges are formed on the sides of the chimneys, much like the eaves on a house. Exiting hydrothemal fluid collects underneath these flanges, forming high-temperature, relatively stationary, clear pools. ALISS’s images tell us a lot about the light emitted at hydrothermal vents. The light’s intensity is highest at the vent orifice and decreases farther from it. Because of rapid mixing with seawater, the temperature of hydrothermal fluids drops from about 350°C at the orifice to about 10°C at a distance of some 20 centimeters above the orifice. Therefore, the higher light intensities appear to correspond to the higher temperatures. An example of the spectra derived from the ALISS images is shown in the figure below left. 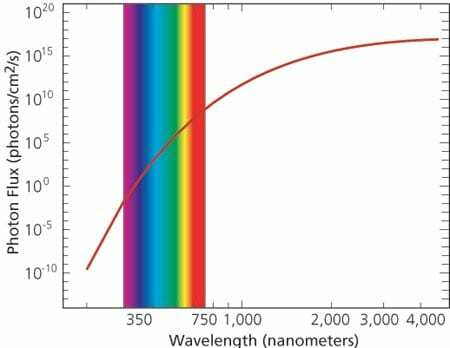 The greatest amount of light is seen in the far red and near infrared region of the spectrum (greater than 700 nanometers). This matches the spectrum of an ideal black body at similar temperatures. Thus, both the spatial and spectral observations suggest a large component of thermal radiation. The data collected from black smokers and flange pools on both the East Pacific Rise and the Juan de Fuca Ridge show very similar results at the longer wavelengths. In all cases, thermal radiation appears to dominate, with hotter vents emitting a greater amount of light. However, while flange pools show no light in the visible range, some of the black smoker data do show a very low level of visible light. Given the temperatures of the vents, the existence of visible light cannot be explained by thermal radiation. Thus, it is still possible that other mechanisms are also contributing to vent light. These mechanisms include, but are not limited to, such phenomena as sonoluminescence (the emission of light due to the implosion of small bubbles) and crystallo- and triboluminescence (the emission of light due to the crystallization and fracturing of crystals, respectively). 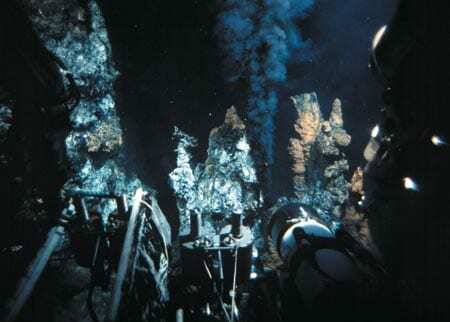 At some hydrothermal vents, the extremely high temperatures and relatively low pressures (with respect to those at the ocean floor) can allow hydrothermal fluids to boil. Under these circumstances, bubbles will form and sonolumin-escence remains a possibility. At all vents, minerals crystallize and precipitate rapidly as the hot, metal-rich hydrothermal fluids mix with colder seawater. As these minerals form, thermal shock might cause them to fracture and emit light. Many of the minerals present at hydrothermal vents emit light in this way under laboratory conditions. Further examination of existing ALISS data and new data to be collected on the Mid-Atlantic Ridge should help to verify what sources contribute to vent light. In calculating the contribution of thermal radiation to vent light, three factors must be known: the temperature of the fluids, the intrinsic attenuation of light by water in the hydrothermal vent environment, and the emissivity of vent fluids. Alvin temperature probes can measure the temperature of the vents, so these are well-documented. Attenuation experiments, using both OPUS and ALISS with an external light source, have helped to determine how much light is attenuated as it passes through the water between the vents and the ALISS instrument. Emissivity is a measurement of how much light is actually emitted by an object. The emissivity of vent fluids is related to the reflection, scattering, and transmission of light through them. Thus, measuring emissivity is not an easy task. An experiment planned for a year 2000 cruise to hydrothermal vents on the Mid-Atlantic Ridge will help ascertain reasonable values of emissivity. An external light source will be directed at the vents at angles of 0° to 180° from ALISS. The reflection, scattering, and transmission of light through the vent fluid can be measured by the camera and then used to calculate the emissivity. In situ measurements of temperature, attenuation, and emissivity will greatly enhance our analysis of the ALISS images and will help to elucidate just how big a role thermal radiation plays in the phenomenon of vent glow. Understanding what causes vent glow and characterizing the light is just the first step. At present, it appears that long-wavelength light at vents is dependent on temperature, which offers some intriguing potential applications. Images of vent light could be used to create thermal maps of vent plumes, which may help elucidate processes by which vent fluids and seawater mix at vents. If light in a certain wavelength band can be found to relate to the chemistry of the vent, imaging vents may provide an in situ way of analyzing vent chemistry. Then there is the question of biological response to light. While we know that the vent shrimp Rimicaris exoculata can detect vent light, it has not yet been proven whether they actually do or how they use that information. Do they use their photoreceptor to “see” the vents and thus locate food? Or do they “see” the vents only to avoid the high-temperature fluids that could cook them? The shrimp are not the only fauna living at vents, and perhaps we will find that other organisms can also detect vent light. While some scientists speculate that life may have begun in hydrothermal vent environments, others take it a step further and wonder if photosynthesis could have originated at vents, as well. The discovery of a non-solar source of light at the ocean floor adds to the list of amazing vent phenomena that were once thought impossible. Development of the ALISS camera system was funded by the National Science Foundation Oceanographic Instrumentation Program. Sheri White is a Ph.D. candidate in the Department of Geology & Geophysics. While she once dreamed of being an astronaut, Sheri now sets her sights down instead of up—some 2,500 meters down to deep-sea hydrothermal vents. When she’s not at sea or in front of her computer, she is a force to contend with on the rugby pitch. Alan Chave is a Senior Scientist in WHOI’s Department of Geology and Geophysics, where he says he specializes in going to meetings and writing reports. When time allows, he builds “toys” to throw in the ocean (hoping they will come back) and has been quite successful at this. 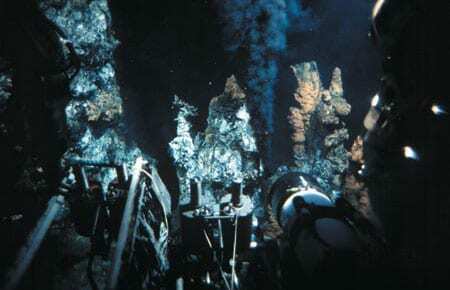 The 3,000-pound active sulfide chimney "Roane" is retrieved from the seafloor during an expedition in July 1998 led by John Delaney of the University of Washington. Studies of geochemical conditions and microbial communities within the hot, sulfide-rich interiors of the chimneys may shed light on the origin of life on Earth and the possibility of life on other planetary bodies. 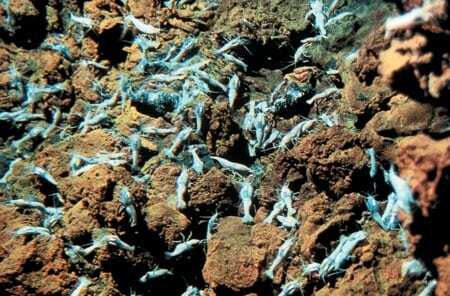 The vent shrimp Rimicaris exoculata swarm near a hydrothermal vent site on the Mid-Atlantic Ridge. 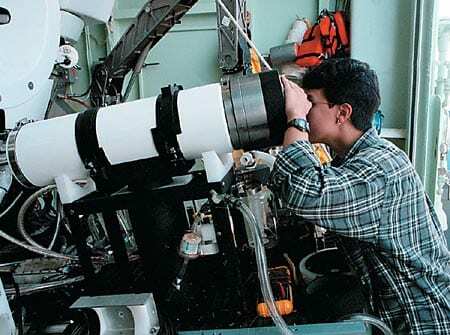 Sheri White checks the alignment of the ALISS filter array during a fall 1997 cruise. 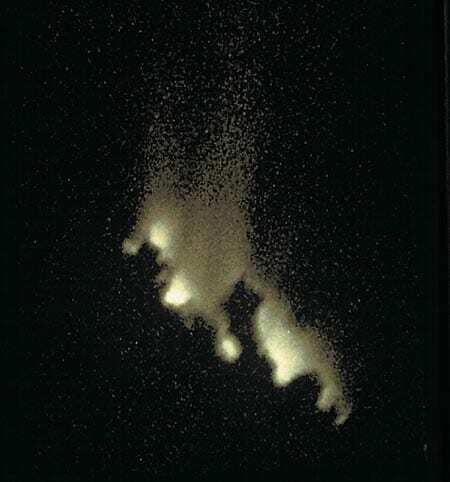 The first image of vent glow taken on the Juan de Fuca Ridge in 1988. Plot of actual data (blue dots) collected at "P" vent on the Mid-Atlantic Ridge and the data expected from a throretical black body at 300°C (red curve). ALISS recorded nine images of "P" vent in nine different wavelengths of light. The image in the shortest wavelength (about 450 nano-meters) is in the upper righthand corner. The image in the longest wavelength (some 950 nanometers) is in the lower lefthand corner. The ALISS camera, mounted on Alvin's science basket, looks at "P" vent at 9°N on the East Pacific Rise. 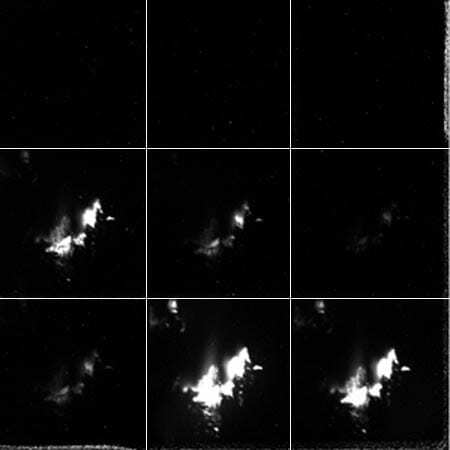 "These two photos show "P" vent illuminated by Alvin's lights (left) and imaged with ambient light in the 870 nanometer band (right).